Elizabeth David's books belong in the libraries of everyone who loves to read and prepare food and this one is generally regarded as her best; her passion and knowledge comes through on every page She was one of the foremost writers on food in the latter half of the 20th century and this book has her most celebrated writing. French Provincial Cooking should be approached and read as a series of short stories, as well written and evocative as the best literature. The voice is highly personal and opinionated, sometimes sharp but always true and always entertaining. Here is a long essay on French cuisine, offering background stories and sketches of recipes more than the slavishly didactic type of recipes that most modern readers might be used to today. 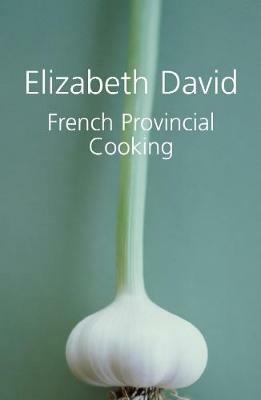 For many Elizabeth David was the first to introduce us to the French notion of la cuisine terroir, sometimes interpreted as `what grows together goes together'. For David, this is the heart of regional cooking, and the thing which most distinguishes it from cooking in haute cuisine restaurants where diners arrive at any time or any season and expect to be able to order any well known French speciality. One of the passages which best characterizes David's approach to a lot of cooking is her opening statement on the perfect omelette: `As everybody knows, there is only one infallible recipe for the perfect omelette: your own.' The book starts with a short essay on each of the major culinary regions of France, starting perhaps not surprisingly with Provence which is blessed with an abundance of produce. The largest portion of the book consists of chapters on cuisine by type of dish: Sauces, Hors-D'oeuvres and Salads, Soups, Eggs and Cheese, Pates and Terrines, Vegetables, Fish, Shellfish, Meat, Composite Meat Dishes, Poultry and Game and Sweet dishes. The book is all the more valuable in that it paints a picture of a cooking style which existed before modern equipment such as the food processor. Most importantly, the recipes work if your aim is to produce the most excellent food imaginable. What initially may seem to be annoying details (e.g., for omelettes, eggs 'should not really be beaten at all, but stirred,' whereas for scrambled eggs, they should be 'very well beaten') are actually secrets to be treasured, that elevate a good dish to a superb one. The lesson is that good food should be done simply, but it takes care, attention to detail, and frequently, time. A hardback edition of French Provincial Cooking has been unavailable for many years and Grub Street is re-issuing it because of overwhelming demand. It should become as popular an edition as the best-selling Elizabeth David Classics.